Want to put your own graphics and messaging outside your front door? 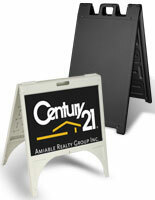 Sandwich board signs are one of the most effective ways to grab the attention of traffic passing by your storefront. Fun and witty messaging is an increasingly popular way to entice customers to come inside your location. 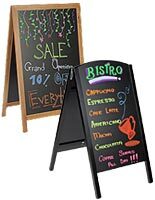 With these outdoor sandwich board signs you can write, add, or change information readily when the need arises. 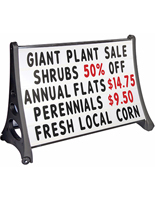 What type of pavement signage are you shopping for? Our expansive collection features changeable letter boards, styles with weighted bases to ensure your messaging stays put, and much more. An outdoor A-frame with a dry erase or wet erase writing surface is perfect for creating dynamic messaging that really pops with vibrant colors while a slide-in style or snap frame can feature your branded graphics! Want something a little more traditional? Check out a selection of folding A-frames with simple chalkboard surfaces. Our entire restaurant sandwich board sign product line is composed of fixtures that are either completely injection-molded or framed with extruded aluminum. Either type is suitable for indoor or outdoor use. These signs are efficient, changeable and weather-resistant or in some cases entirely weatherproof. Call out weekly specials, flash sales or if you own a salon, let your customers know you accept walk ins! 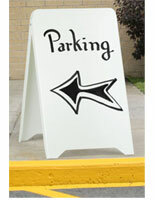 We carry sidewalk signs for any kind of retail establishment at reasonable prices that fit any budget. These letter board displays are especially suited for restaurants, pubs, salons, boutiques or any other storefront location that can benefit from outdoor advertising. Most are lightweight, yet well-constructed and can be moved easily. While rated for outdoor use, they can just as quickly be used indoors to highlight a new product, or entice passersby to try your lunch specials. Not sure what type of signage you're looking for? Check out "Sidewalk Signs: A Buying Guide" for helpful hints on what best suits your business needs. What are some common uses for a sidewalk sign? Restaurant owners use outdoor sandwich board signs to promote lunch & dinner specials or to post witty messages that give customers an idea of the fun they’ll have inside. Salons owners use sidewalk signage to promote walk-in traffic. 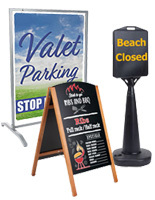 Valet services or public parking lots will often use A-frames to direct the flow of traffic or notify patrons of a full lot. 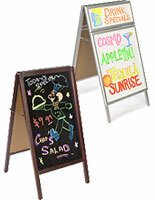 Typically A-frame signboards are used to display menu items or daily specials on sidewalks or curbside. Many retailers have caught on to the effectiveness of these portable displays and nowadays, these folding units are seen all over the place. Indoor/outdoor sign boards aren't limited to use just in restaurants! With one of these sandwich signs, consumers can see your messaging in shopping malls, public parking lots, at sporting events, even in schools. 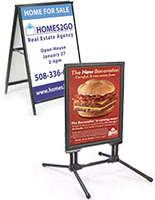 The large size and ease of portability make these retail A-frames a fairly inexpensive alternative to large billboard printing, or media advertising. What style works best for your company? Letter boards are a great solution for sidewalk advertising. Each unit comes with a complete set of letters and symbols to create a custom message. Use the display to announce a seasonal sale for a retail store, or a summer drink special for a bar or tavern. This sidewalk sign is also great for use by store owners who may not have a large window in their storefront to hang marketing signage. 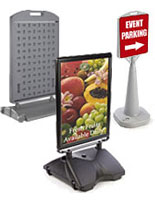 View other types of outdoor signage & displays for sale here. 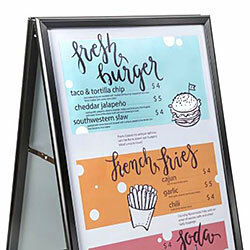 Displays2go offers these A-frames in many styles that are in stock and ready for immediate shipping.